The Art of Reading presents the first retrospective of Lawrence Schwartzwald’s candid images of readers, made between 2001 and 2017. Partly inspired by André Kertész’s On Reading of 1971, Schwartzwald’s subjects are mostly average New Yorkers—sunbathers, a bus driver, shoeshine men, subway passengers, denizens of bookshops and cafes—but also artists, most notably Amy Winehouse at Manhattan’s now-closed all-night diner Florent. In 2001 Schwartzwald’s affectionate photo of a New York bookseller reading at his makeshift sidewalk stand on Columbus Avenue (and inadvertently exposing his generous buttock cleavage) caused a minor sensation: first published in the New York Post, it inspired a reporter for the New York Observer to interview the “portly peddler” in a humorous column titled “Wisecracking on Columbus Avenue” of 2001. 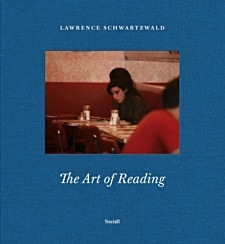 Since then Schwartzwald has sought out his readers of books on paper—mostly solitary and often incongruous, desperate or vulnerable—who fly in the face of the closure of traditional bookshops and the surge in e-books, dedicating themselves to what Schwartzwald sees as a vanishing art: the art of reading. Lawrence Schwartzwald: Born in New York in 1953, Lawrence Schwartzwald studied literature at New York University. He worked as a freelance photographer for the New York Post for nearly two decades and in 1997 New York Magazine dubbed him the Post’s “king of the streets.” Books and literature have shaped several of his photo series including “Reading New York” and “Famous Poets,” both self-published in 2017. Schwartzwald lives and works in Manhattan.